Ever wanted to step inside a painting by your favorite artist? Veteran journalist David Millward did just that. Kind of. [E]ver since my wife and I started toying with the idea of leaving London and moving to Maine, where my wife was born, the two of us had been looking somewhat wistfully at an enlarged Cape Cod house in Ogunquit. The place was just down the road from the holiday condo where we would stay on visits, and it was considerably more attractive than the functional, circa-1980s flat on the banks of the Thames that we called home. Although the building had been renovated over the years — to accommodate, among other things, a garage and a room that is now my office — it had retained its original New England charm. When I was offered the chance to work as a U.S. correspondent for The Telegraph, our pipe dream became a reality. The house was still on the market when we crossed the Atlantic. We bought it in the depths of a fierce New England winter and moved in after six weeks of building work. But nothing prepared us for the surprises the house had in store. According to official records, our home was built in 1929, but one of the builders we hired to refurbish the place told us he was convinced that it was older. Then, at a party welcoming us to the neighborhood, our discussion with a neighbor turned to the rich artistic tradition of Ogunquit, which dates back to the late 19th century. We stared at the painting and became convinced: Edward Hopper had painted our home a decade-and-a-half before it was built. The party’s host, Chris Woodbury, is the grandson of Charles Woodbury, who founded the town’s first artists’ colony in 1898. He handed over a book about the painter Edward Hopper and drew my attention to a painting of a large slab of rock with a few houses in the background. 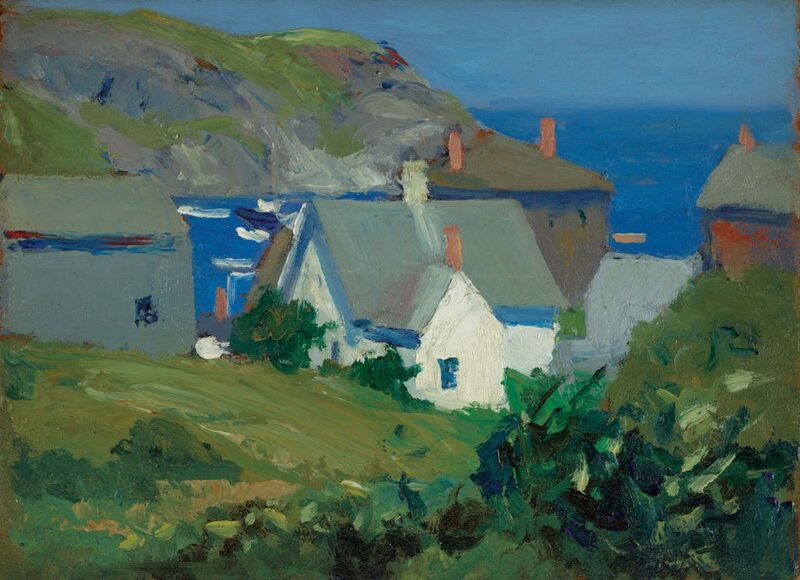 The painting is entitled Rocks and Houses, and the book said that Hopper finished it in 1914. That slab in the foreground, Chris said, was a chunk of rock that he himself had blasted away to gain access to the road leading from his own house down to Perkins Cove. That was when the penny dropped. If that was his rock, then that meant the house directly behind it should have been ours. Except that Rocks and Houses predates our house’s supposed construction by 15 years. Still, the closer we looked, the less doubt we had. For one, the painting clearly depicts the same barn that appears in an old sepia photograph of our house left to us by a previous owner. In the Hopper painting, the house in front of the barn is white. Ours is what the Benjamin Moore brochure describes as “frosted café.” Our house also lacks a wraparound porch visible in the Hopper painting — but in 1996, the former owner had extended our sitting room, which would explain the porch’s absence. [T]he riddle was solved by a local real estate agent who told us about a fire in Ogunquit in the early 20th century that destroyed many of town’s property records. Just when this fire occurred seems to have been lost in the mists of time, but after the ashes cooled, local officials decided somewhat arbitrarily to decree that our house and many others had been built in 1929. Our curiosity aroused, my wife and I decided we were going to have to track this painting down. Naturally, we began by googling, learning that the original painting is owned by the Whitney Museum of American Art in New York City. I fantasized that perhaps it was one of two Hoppers the Whitney loaned to the White House last year — our house, hanging in the Oval Office, where President Obama stares at it daily while making world-altering decisions! Click to see an online map to the locations below. Alas, Rocks and Houses is not even hanging at the Whitney — it’s in storage, along with the great majority of the 2,000 works that Hopper’s widow left to the museum in 1968. When I approached the Whitney and explained that I would like to see the picture, I was initially met with something of a deafening silence. It took several phone calls, emails, and an appeal on our behalf by Philip Koch, a leading authority on Hopper, before the museum granted us access. And so, early last September, a Whitney staffer welcomed my wife and me into a rather drab repository in Manhattan. Part of the condition of seeing the picture was that we would on no account disclose the location of this warehouse — which, given the value of what it holds, is understandable. After making our way up a couple of floors in a clunky old lift and wending our way past some dusty crates, we reached the storeroom where the painting had been put on display for our inspection. At 29 by 24 inches, it was rather bigger than I had anticipated. It was also less autumnal in hue than it seemed in the reproductions. Up close, the vegetation in front of the rocks appears to have been dabbed on with rather thick swatches of green paint, while the struts on the porch of our house were carefully added with a thinner brush. It was very different from other Hopper works I’ve seen. 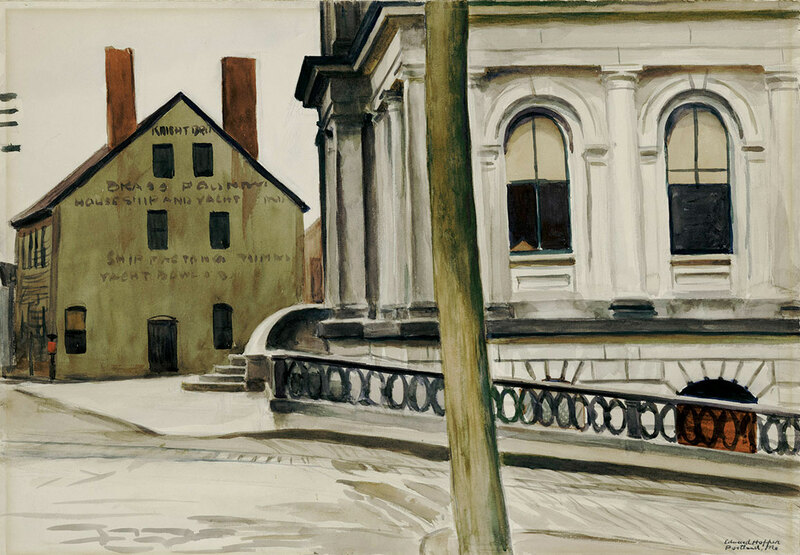 There were no people in it, for a start, and unlike Hopper’s later paintings, there was no narrative to it. In short, it was just a painting of a slab of rock with a barn and a couple of houses, one of which happened to be ours. It turns out that Hopper didn’t think too much of this particular early work either, as he exhibited it just twice during his lifetime. The Whitney, however, has shown Rocks and Houses all over the world, and the painting has its admirers. During his time in Ogunquit, plain Ed Hopper stayed at Ma Perkins’ guesthouse, all of 100 yards away from our place. It was there that he met his future wife, Jo Nivison. 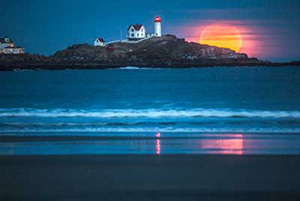 He was enchanted by Ogunquit and Perkins Cove, an enchantment since experienced by whole generations of artists who’ve flocked to this once-sleepy fishing village. In fact, it turns out that Edward Hopper wasn’t the last artist to have an association with our house. For a time in the 1940s, it was occupied by one Ralph Booth, a landscape painter from Fishkill, New York, who migrated to Ogunquit and still enjoys some local, if not global, renown. 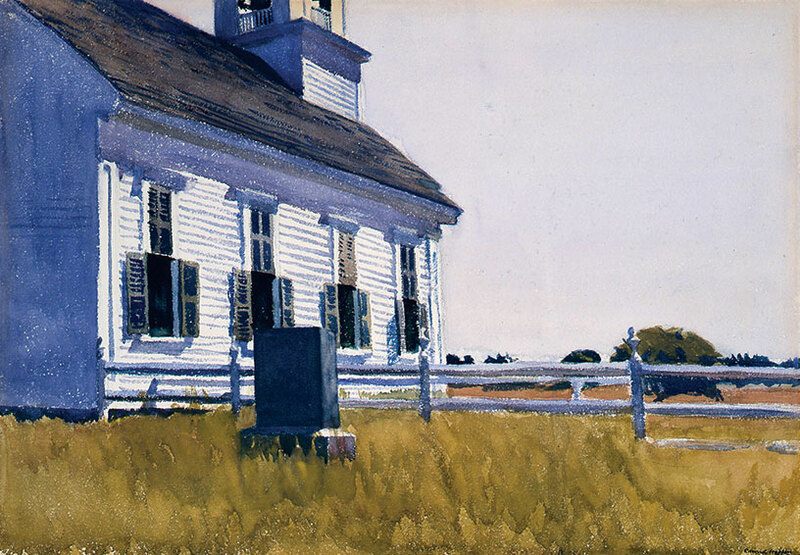 Today, Hopper’s paintings sell for stratospheric amounts. 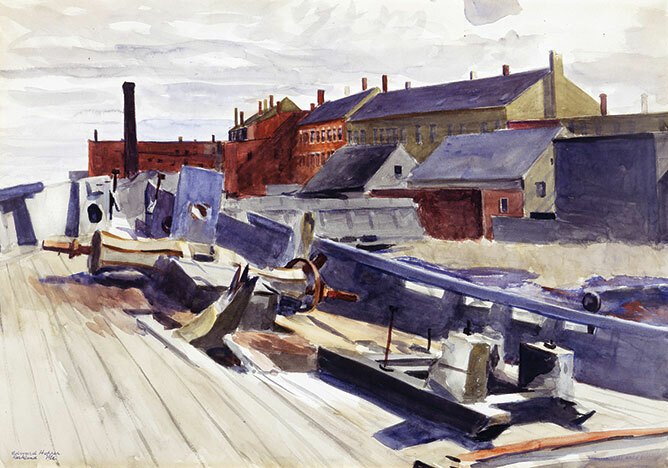 In 2013, his painting East Wind over Weehawken sold at auction for $40 million, setting a new record for a Hopper work. At prices like that, I suspect “our Hopper” is likely worth several times more than our house itself, so it will not be hanging in our hallway anytime soon. We did recently find a lovely and affordable Ralph Booth, however, and it looks very nice in our living room. Get the best of Maine Travel, Food, Culture, and Homes & Gardens every month, with a subscription to Down East, the Best of Maine. Gift subscriptions available. David Millward is a U.S. correspondent for The Telegraph of London. He’s covered stories from Beijing to Belgrade and spent years following English soccer hooligans around Europe.